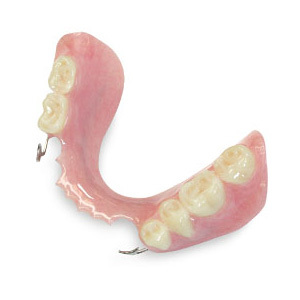 When you hear the word “dentures” you probably think of an appliance that replaces all the teeth on a dental arch. But there is another type: a removable partial denture (RPD), which can be a viable option for replacing a few missing teeth. An RPD rests on the bony gum ridges that once held the missing teeth and are secured with clasps or other attachments to adjacent teeth. While lightweight, RPDs are designed to last for many years — they’re made of vitallium, a light but very strong metal alloy that reduces the RPD’s thickness. Recently, metal-free partial dentures are being used that don’t have the fit or longevity of the vitallium partial dentures, but are considered more of a cosmetic solution. RPDs are custom-made for each individual patient to accommodate the number, location and distribution of teeth missing throughout the mouth. Their design must also reflect the health and stability of the gums and remaining natural teeth to ensure they won’t move unduly during normal mouth function, and will be as lifelike and unnoticeable as possible. RPDs have been a mainstay in dentistry for many years and represent a less expensive tooth replacement option than implants or fixed bridgework. But they do have their downsides: because of their method of attachment to the remaining natural teeth they tend to accumulate plaque, which increases the risk of both periodontal (gum) disease and tooth decay. Their fit requires that they attach to the adjacent teeth that will cause some damage and lead to their looseness over time. If you wear an RPD, there are some things you can do to decrease these problems. First and foremost, you should clean your RPD thoroughly every day, as well as brush and floss your remaining teeth to reduce plaque buildup especially at contact points. Be sure to remove the RPD at night while you sleep. And keep up regular dental visits not only for additional plaque removal but also to allow us to inspect the RPD for problems or wear. An RPD is a viable option for improving mouth function and restoring your smile after multiple tooth loss. With proper care and maintenance, your RPD can serve you well for many years to come. What are Common Bad Breath Causes? If you suffer from chronic, severe bad breath, also known as halitosis, it's important to identify the cause so you can determine an effective treatment. Tobacco use. If you smoke, quit. Your bad breath may be due to other causes, too, but tobacco use is a guarantee of bad breath. If you are ready to quit, ask your doctor or dentist for advice and support. What you eat, or don't eat. Certain foods, such as garlic, contribute to bad breath, but only temporarily. Once they are absorbed into the bloodstream, the smell is expelled through the breath, but the odors remain until the body processes the food, so there’s no quick fix. Dry mouth. If your mouth is extremely dry, there is not enough saliva to wash away excess food particles and bacteria, which can cause an unpleasant smell if they build up on the teeth. Infections. Bad breath that seems to have no other cause may indicate an infection elsewhere in the body. If you have chronic bad breath and your dentist rules out any oral problems, see your doctor for an evaluation. Bad breath can be a sign of a range of conditions including respiratory tract infections, chronic sinusitis or bronchitis, diabetes, or liver and kidney problems, so it's important not to ignore the problem. The best way to improve bad breath is to follow a thorough oral care routine including twice-daily tooth brushing and daily flossing to remove the food particles and bacteria that can cause bad breath. Mouthwashes only improve bad breath for the short term, and if you have a chronic problem, your dentist may suggest an antimicrobial rinse to help keep bacteria at bay. Adolescents are busy people with unpredictable eating habits and schedules. But they’re still very interested in how they look, so parents can encourage oral hygiene by reminding them that regular brushing and flossing will help them look better by promoting a healthy smile and fresh breath. One important component of oral hygiene for many adolescents is learning how to floss with braces. Explain to your braces-wearing child that flossing will take quite a bit longer with braces, but that it is important for them to make the time and the effort in order to help prevent plaque buildup, which can lead to tartar, and keep their teeth healthy to enhance that smile once the braces come off. Sometimes children start wearing braces prior to adolescence. If you have a younger child who wears braces, it may take longer for him or her to learn to floss, and parents may need to provide some help. Two products that can help children and teens (or adults, for that matter) floss with braces are a floss threader or a special orthodontic floss, such as Oral-B® Super Floss®, which has stiff ends that can be threaded under the braces’ main wire. Follow the proper technique for flossing: Gently guide the floss between the teeth and slide it under the gum, curving it in a “C” shape to clean the tooth surface. If your child or adolescent prefers to use a floss threader, he or she can use any type of floss. Place the floss through the threader, then slide the pointed end of the threader under the main wire of the braces and pull it through, so the floss is positioned under the wire. Then proceed with the proper flossing technique. Once children start school, parents have less influence over their meals and snacks during the day. Set an example for your children by eating a variety of healthy foods yourself, and by following a consistent oral health care routine of twice-daily tooth brushing and daily flossing. You may think that children don’t notice, but they do. Pack plenty of fruits, vegetables and whole grain foods as healthy snacks, and keep the sugary drinks to a minimum—they are among the factors that can promote tooth decay.